Atascocita Wan has a new home and his new name is BOONE. Sue and Jim live in Liberty Township. 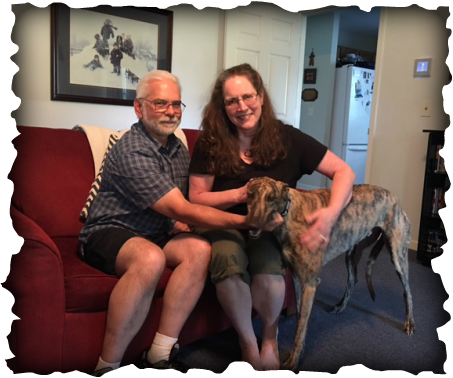 They have a friend that recently adopted a greyhound from GAGC and Sue started doing some research on these greyt dogs and fell in love with the breed like so many of us have. After a few minutes checking out his new home he laid down in the living room. Sue joined him on the floor and Boone snuggled up next to her, pawing at her for more attention. This is a greyt match and yes he will definitely be spoiled.